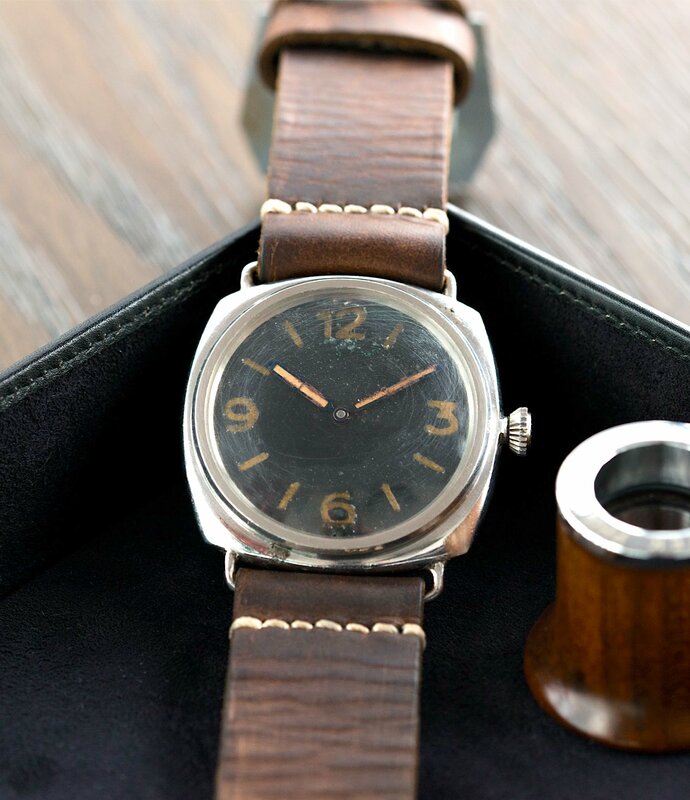 Modern Panerai gets a hard time from many enthusiasts. Some have called them ‘the new Hublot.’ Others have coined the motto ‘rebranding the Luminor since 1990.’ A fraction of that criticism is deserved, while the larger ratio is not. However, even the most cynical collector cannot deny the depth of history this Italian mark holds. One of the purest and most attractive pieces in all their history is this, the 3646. The Rolex-made 3646 was released around WWII (1940 to 1944) to Italian Navy divers. These Italian frogmen were famously successful. Not to be outdone, the German Navy adopted Panerai a few years later in the famous Kampfschwimmer. The 3646 was the first to feature what has become known as the radiomir dial, a 3-6-9-12 layout. Radiomir was a trademarked name for the glowing dial lume, a first of its kind and very useful for divers. It turned out to highly radioactive, but that’s another matter. The success of this brilliant 3646 design is Panerai’s foundation today. Interestingly, the transitional nature of this example’s markings place it as being assembled during the Nazi occupation of Florence. This may mark this as a German-stolen case, but precise provenance is not determined. Its movement has been professionally restored, but the remainder is untouched. The reference rarely comes to market, usually at auction. A Collected Man, a very respected dealer, offers this example. The 3646 serves as one very attractive, hugely significant bit of horological history. Find it here for 65000 GBP. Be among the first to our best content, exclusives, and events. © 2018 THE HAIRSPRING. ALL RIGHTS RESERVED. POWERED BY PARACHROM, COFFEE, AWS, AND WORDPRESS.